Having made beds for the kids, the time came to finally make a bed for us. While my wife has always preferred the more traditional pencil post European beds (Queen Anne), complete with canopy, I always liked the sleigh bed styles. Our relatively cramped bedroom made it difficult to rationalize either. After many weeks (more like months !) 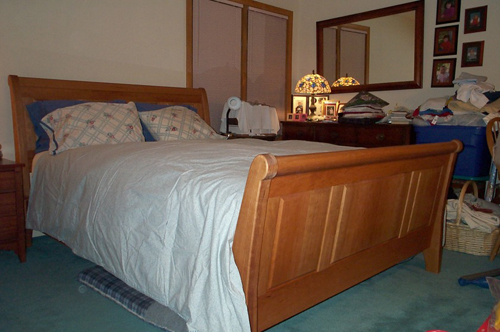 of indecision, I finally settled on a sleigh bed; but one that uses only slightly more space than a "standard" bed. 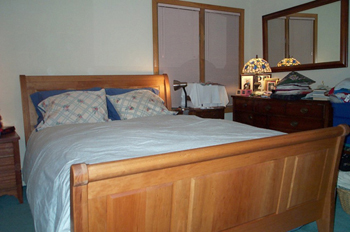 Sleigh beds usually consume extra floor space behind the headboard and in front of the footboard. To keep the bed compact, I limited the angle and size of the head/footboards' protrusion. This had the added benefit of simplifying construction since I could use flat raised panels rather than curved ones. I angled the panels to provide a sense of "tilt" to the unit, reinforcing the idea of sleigh design. The bed is made of solid cherry. 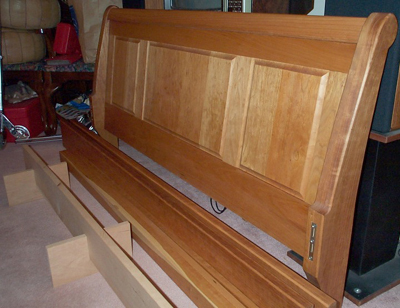 The two main bedrails are made from 6/4 stock, while the rest of the bed is made from 4/4 stock. The finish is hand rubbed Watco natural color Danish Oil and wax. Four beams span the bottom to support the mattress and boxspring. The 4/4 beams sit on cleats tied to each rail as well as to a free-standing center support. The main rails hang onto the head and footboards via standard quick-release bed hardware. Below are pictures taken during construction. I started by assembling the basic components that would go into this bed. The four legs were glue up from thinner stock and rough cut to shape. 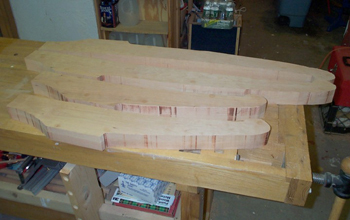 Each pair of legs were then clamped together and sanded as a unit to make sure they would come as similar as possible. Here are the rough and sanded leg parts. The raised panels required a good bit of glue work. 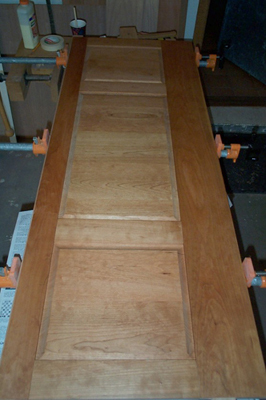 Each panel was assembled, sanded and finished prior to assembly into its frame. These are rough-cut parts for the frame that hold the panels. These are the pre-finished raised panel inserts. Everything has been pre-finished at this point. Above each raised panel is a rounded piece that caps the unit. This piece is rough cut on a table saw, shaped with a hand plane, and attached to the raised panel assembly by a dado on its underside. 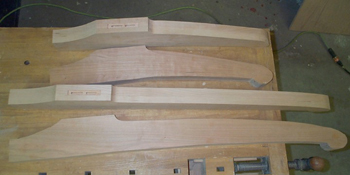 Three tenons extend from the head/footboard assembly into mortises in the legs. 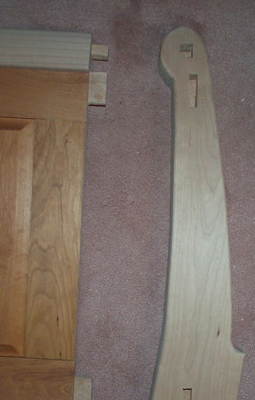 These tenons are glued, then locked in place with a dowel, whose hole is concealed with a cherry plug. Attaching the legs to the panel assembly. 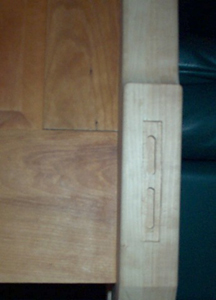 The completed head and footboard, minus the finish on the legs. 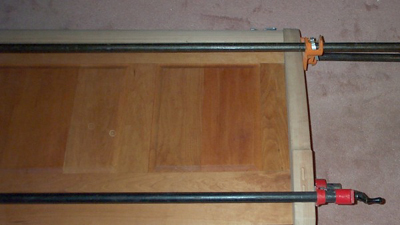 The main rails attach to the legs with simple metal bed fasteners. These devices are easy to use and very strong. I've used them on other beds with great results. The four pictures below show (in order) the recess in the leg for the female plate, the female plate attached with #10 stainless steel square drive screws, the male fastener attached to the rail, and the resulting joint when assembled. 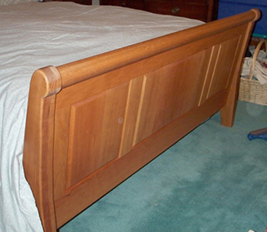 Notice the cleat on the main rail used to support the four beams that stretch the width of the bed below the boxspring. In order to keep the boxspring and mattress from sagging under load, a simple center support was added. 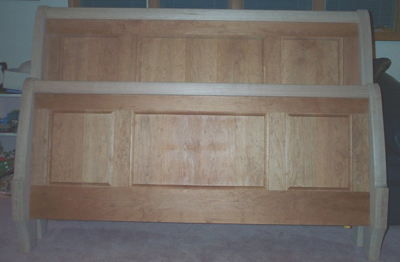 It is made from 4 pieces of unfinished cherry, notched to form the unit shown below. No fasteners required; comes apart if needed. Here are almost all of the pieces just prior to assembly. To the left is the center support; followed by a stack of four beams that support the load (some sapwood is visible on these beams which are hidden from sight); then the two rails and the footboard. The headboard is not in the picture. Some more pictures of the completed bed.